This would probably be considered some of the best writing in X-Men comics ever. 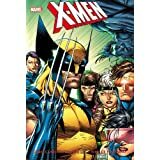 The impact of these comic-books in the late 80’s was HUGE, not only in the stories of the X-Men universe, but in the USA comic-book publishing world: we are witnessing a big part of the birth of Image Comics in this omnibus, and a whole new way of creating and understanding comics at the time. The impact and relevance of these publications at the time is undeniable, and for better or worse they changed forever the landscape of the comic-book market in the USA.